As the days get longer, I am seeing and hearing more and more birds. 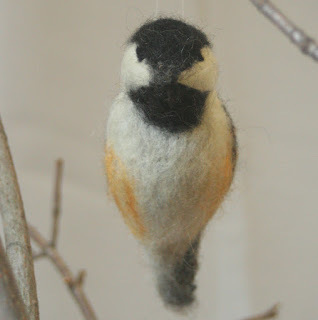 I love chickadees - the way they move, the sounds they make, and of course, how they look. In the past week or two, the neighborhood chickadees have finally figured out that I have seed out and have been really active in the morning. Here's one that I made, not nearly so cute as the real ones!